When Texas gained its independence in 1836, surgery was a medical treatment of last resort, always painful and often fatal. Now the average American can expect to undergo at least seven surgeries in a lifetime. The evolution of surgery from the earliest civilizations to modern day advances is on display in the Texas Medical Association’s (TMA’s) History of Medicine Gallery. Anesthetic masks used to administer ether or chloroform to patients, c. 1900s. TMA’s “Cutting Edge: A History of Surgery” presented by the association's History of Medicine Committee, honors the centennial of the Texas Surgical Society in 2015 by exploring improvements that allowed surgery to become essential to medicine. The exhibit features stories of the primitive and precarious nature of early Texas surgery from the time of the Spanish explorers to the Alamo to advances in anesthesia and safer surgery around the turn of century. “Uneven quality of surgical care leads to formation of Texas Surgical Society in 1915,” said Texas Surgical Society Archivist Mellick Sykes, MD. Meanwhile “Texas’ surgical reputation has skyrocketed from backwater to beacon” from the early years of the Texas republic to the present, Dr. Sykes said. 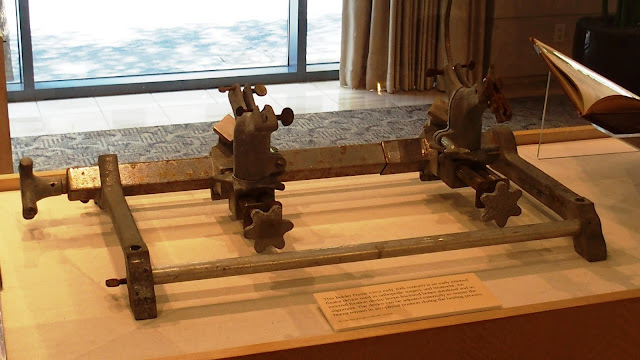 Artifacts on display in the exhibit display like the steam atomizer, a device used to sterilize surgical incisions or wounds, illustrate both the inventiveness and limitations of the early Texas surgeons. Also on display is the Bohler Frame, an early 20th century metal device used to keep fractured bones stable during the post-surgery healing process. Cutting Edge: A History of Surgery also recognizes the role of pioneering Texas surgeons who brought international acclaim to Texas with their innovations and skill in transplant surgery. “The TMA commitment to the history of medicine — the successes, failures, and struggles of our doctors and our institutions — is deep and longstanding. The TMA archives preserve this story,” Dr. Sykes said. “Cutting Edge — A History of Surgery” is in the History of Medicine Gallery on the ground floor of the TMA building at 401 W. 15th St. in Austin through March 2016. It is free and open to the public 9 am-5 pm Monday through Friday. For more information or to arrange a tour, call (512) 370-1552 or (800) 880-1300, ext. 1552, or email knowledge@texmed.org.